Damaged windows on the 32nd floor room at the Mandalay Bay Resort and Casino used by gunman Stephen Paddock are seen on Oct. 2, 2017. Las Vegas police have released some footage from officers' body cameras. Newly released body camera footage from the Las Vegas Metropolitan Police Department provides a closer look at the tense moments for police during and following the October 2017 mass shooting in which Stephen Paddock opened fire from his hotel room windows, killing 58 people and injuring hundreds more. The footage from two officers was released Wednesday in response to a lawsuit brought by multiple news organizations seeking the release of 911 recordings, bodycam footage and documents related to the shooting. 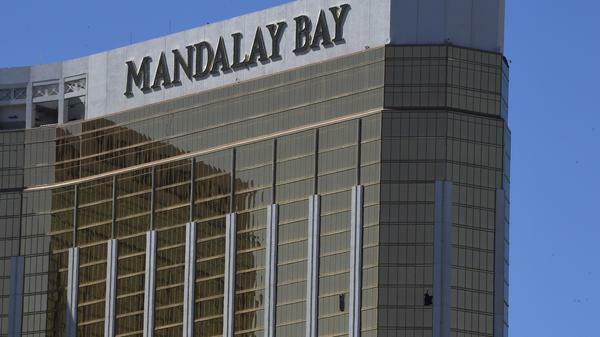 Video released to The Associated Press includes the moments after police entered Paddock's room on the 32nd floor of the Mandalay Bay Resort and Casino to find the 64-year-old man dead from a self-inflicted gunshot. "That's our shooter over there," one officer says. "OK, we got one suspect down ... this is clear," the officer wearing the camera says a few seconds later. The camera captures a room with semiautomatic rifles strewn about on the floor and on a tub. Multiple officers walk around inspecting the room. At another point, they note the system that Paddock used to see when police were approaching his hotel room. "He has a intricate camera system set up, out to this," the officer wearing the camera says, pointing out the open door to the hallway. "So he knew when officers were coming down the hallway." "There's a whole suitcase full of loaded AK mag[azine]s," another says. Police found more than 20 AR-15 and AR-10-style rifles in the two adjoining rooms Paddock booked at the Mandalay Bay hotel. In another video provided to the AP, an officer drives in a police car with a siren on. The scene illustrates the confusion early on as police respond to the many reports of shots fired near the hotel. The radio is busy with police trying to narrow the location of the shooter. "We have a rifle deployed, we're in front of Mandalay Bay, we're trying to see where the shots are coming from," a voice says. "If anyone can advise, is it coming from Mandalay?" "Automatic fire. Fully automatic fire from an elevated position, take cover," someone on the radio says at another point. Law enforcement officials later said Paddock used bump stocks, which enable semiautomatic rifles to fire in a way similar to automatic weapons. Automatic weapons are tightly regulated and not often used in crimes. The video of the officer in the car cuts back to a hotel room. "I'm really thinking this is just a one-guy thing," one officer says. "I hope so, but what about all the other calls, was that just people panicking?" another asks. "People panicking, sounds like," someone says. The two videos are part of about 2 1/2 hours of video police released after the Nevada Supreme Court on Friday refused a request by the Las Vegas police to delay the release. Several media outlets had sued to obtain 911 recordings, body camera video and other documentation after police refused a request to release the information. The police had argued against the release of the recordings, saying the release would "further traumatize a wounded community." It would also force officers to "relive the incident," Las Vegas Sheriff Joe Lombardo told reporters Tuesday. Police also argued that the work to review the footage would be too costly and require a significant amount of funds and manpower. "It takes a significant amount of effort and resources for detectives to review, approve body camera footage, 911 recordings and documents for release," Lombardo said at a news conference in preparation for the release, saying the effort is costing taxpayers "several hundred thousand dollars." Lombardo said more recordings and documentation would be released on a rolling basis. In March, video released from hotel and casino security cameras shows Paddock appearing to be "an ordinary hotel guest and casino patron," as NPR's Scott Neuman notes, even as he brings suitcase after suitcase of weapons up to his room. Despite the release of the videos, Paddock's motive for carrying out the deadliest shooting in modern U.S. history remains a mystery.